Golf crib bedding is the first and best step toward putting together some golf ball nursery decorations. But once you have found and chosen the perfect set, we have some cute DIY crafts and decorating ideas that will put your project over the top! Making your own crib set and window treatments may also be an excellent idea since while there are yards upon yards of golf themed fabrics; there is a limited number of bedding sets to choose from. Go here to see more golf themed nursery bedding sets and accessories that can be personalized for your decorating project. If the color scheme of these sets are not what you had in mind, the best solution for the lack of said golf crib bedding is to get some golf print fabric and make our own. It would be easy to sew a simple duvet, comforter, crib skirt or dust ruffle. Another option would be to accessorize argyle fabrics with golf themed decorations that you can make yourself. There are even Baby Tweety Bird and Snoopy patterns as well as other Looney Tunes fabrics worthy of consideration. 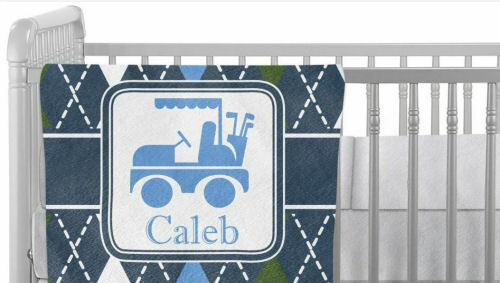 A personalized argyle baby blanket with a golf cart graphic is sure to be a treasured keepsake. Both of the golf theme fabrics that would work well for golf crib bedding had pictures of Looney Tunes cartoon characters that had a retro look to them but were still very colorful. 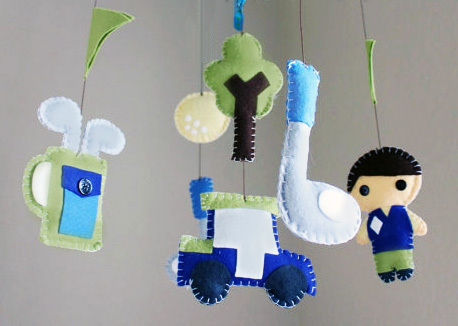 Visit dropsofcolorshop to see a variety of mobiles with golf themed decorations. And those are just a few of my favorite craft projects . The key is to start saving used golf balls very early in pregnancy! If these fabrics have colors that you want to work with the rest of the decorations for the baby bedroom will be easy to find. A few Baby Tweety Bird or Baby Snoopy collectibles displayed on shelves lining the nursery walls will get your baby boy's nursery or your little girl's themed room out of the rough with one smooth swing! For a baby boy’s nursery there are some very masculine golf print fabrics. There’s one really cute golf balls print fabric with a baby blue background. This material has a golf ball and golf tee print all over it. The main colors are a turquoise blue, white and black with some bright red accents. With a really active print on the golf crib bedding such as the one I just described, there’s no need for other active prints and decorations. I would even try to choose a coordinating solid color over a print for the drapery treatments. Golf theme home decor is nothing new; it’s just that it’s been confined to the game room, the den or other casual rooms in the home. There’s been a huge growth in popularity of the game of golf. 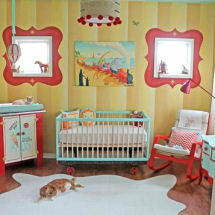 It has also become very trendy for parents to bring baby on board in regard to all the family’s hobbies and activities. For these reasons somebody should put together a nice golf crib bedding set! Until they do, don’t despair there are enough golf print fabrics so that you can make your own and play straight through with your baby nursery theme.